If you want to become a part of shaping nursing students to become talented nursing professionals, you may want to become a nurse educator. A nurse educator is a talented teacher and an expert nurse who students and even patients can turn to when they have questions about delivering care and receiving care. There is a growing shortage of nursing graduates to fill in the growing supply of nursing positions that exist today, and this means that the demand for nursing educators is growing as well. If you want to fill in the gap, here is your guide to become a nurse educator. You will need to earn your certification to work in nursing education. Professionals who have passed the standardized certification test are called Certified Nurse Educators or CNEs. Before you can sit for the CNE exam, which is administered by the National League of Nursing, you must meet one of two educational and experience eligibility requirement options. Option A is to possess your RN license and a master’s degree in nursing with an emphasis in nursing education or nine or more credits in education. Option B is to possess a license, a master’s degree in nursing and at least two years of experience in an academic setting. After you meet these requirements, you will be eligible to sit for your CNE test. The next step to preparing for a career in nursing education is to prepare for your exam. You must pass your exam and then complete a background check to be granted your license to educate nursing students. A CNE exam consists of 150 questions, which are all multiple choice. Out of all of these questions, only 130 questions are counted towards your final score. You will be tested on recall, application of information, and analysis of the information. The test is a computer-based test that will assess your knowledge and readiness to take on the full scope of faculty roles. To prepare for the CNE exam, it is in your best interest to take the Self-Assessment Examination to see how well you score on the practice exam. This is an official test that has been approved by the NLN, so you know that it will ask you relevant questions that are similar to those on the actual exam. If you are not comfortable studying by yourself, there are plenty testing partners that have group study sessions all throughout the nation. You may want to consider looking for upcoming study dates so that you can begin to review the material and study with other students who are in the same position that you are in. Once you meet all of the requirements and you are confident with your ability to pass the CNE exam, you need to submit an application to register for the exam. You must prove you have the right educational credits and experience. You must also pay the examination fee. Once you are approved, you can schedule a test date online at a local assessment center. Be sure to bring all of the documents you need to be admitted into the center. 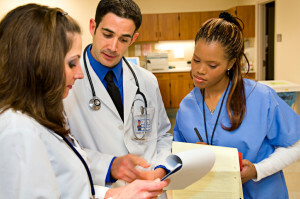 Once you receive a passing grade, you have completed the steps to become a nurse educator.